IU inducted 291 individuals into its most prestigious donor recognition society, the Presidents Circle, which honors individuals whose lifetime giving to IU has reached $100,000. IU President Michael A. McRobbie and IU Foundation President Dan Smith presided over the ceremony. Chancellor Cruz-Uribe joined IU East as the campus’ sixth chancellor in 2013. Gene Cruz-Uribe joined her on campus as a tenured professor of history. 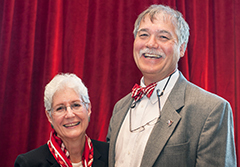 The Cruz-Uribes brought a wealth of knowledge and experience to the IU East campus. Both immersed themselves in the culture of the campus and community. They immediately became active supporters of IU East students, fans and regular attendees of IU East Red Wolf athletics, participants in the IU East chorale and members of community boards. The Cruz-Uribes led by example through their philanthropic support. 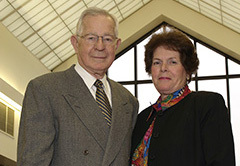 In 2013, the couple gifted $50,000 to help construct IU East’s Student Events and Activities Center. To recognize their generosity, the campus dedicated the Chancellor Kathryn Cruz-Uribe and Eugene Cruz-Uribe Interactive Classroom located in Springwood Hall in September 2017. Additonally, the Cruz-Uribes made a $100,000 gift to endow the Gloria & Joseph Allwarden and Lillian and Antonio Cruz-Uribe Scholarship, which honors their parents and family heritage. The endowment honnors the support of their parents, who instilled in them the belief that higher education is the key to a better life. Gene Cruz-Uribe passed away in March of 2018. His support and legacy at IU East continues. 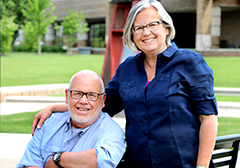 In 1979, Rob and Nancy Tolley joined the IU community as he began teaching anthropology in the School of Humanities and Social Sciences at IU East. Becoming full-time faculty in 1991, Tolley taught hands-on courses in archaeology, anthropology, and sociology, and led students on countless off-campus expeditions to Colorado, Montana, and Utah. Tolley readily earned a reverence from students and fellow faculty alike with his innovative instruction and leadership into the realm of online learning. For many years, Rob also took initiative in the IU East Campus Campaign as a campaign chair and a member in supporting faculty- and staff-led campus giving. Nancy Tolley, a veteran school psychologist, also shares this passion for giving and higher education, and understands the importance of supporting students through scholarships. Inspired by the philanthropy of other faculty, the Tolley’s made a gift to support vital, hands-on learning in archaeology in the form of the IU East Archaeology Lab—an outdoor facility where students are able to study forensics, excavate sod mounds, and simulate archaeological digs. The Tolleys also donated their time and vision in endowing the Anne Szopa Scholarship in memoriam of the IU East professor of sociology. Through their gifts, the Tolleys exemplify the contributions and talent that inspired them alongside their individual impact on IU students, faculty, staff, and the IU community. The Tolley’s traveled from their home in Wyoming to attend the event. Jane Vincent, a professor emeritus at IU East, and her late husband, Wayne, have long been stewards to IU and the Hoosier state. After receiving both her bachelor’s and her master’s degrees in nursing at IUPUI in 1957 and 1961. Jane continued her education, earning an Ed.D., while transitioning her invaluable experience in nursing to develop and forward the nursing program at IU East. Jane Vincent received various teaching and service recognitions, namely the Distinguished Public Service Award from IU Council of Nursing Faculty in 1997; the Teaching Excellence Recognition (TERA) 1997 and 1999 from IU East; a FACET Award in 1998; the 2000 Distinguished Service Award from the IU School of Nursing Alumni Association; The Lifetime Achievement in Nursing Award in 2002 from IU East Nursing Faculty; the State of Indiana Sagamore of the Wabash distinction in 2002; and the IU East Chancellor’s Medallion in 2014. Wayne Vincent was a seasoned organist, lifetime music enthusiast, community activist, avid contemporary art collector, and leader in the field of planned benefit underwriting in Indiana. He brought a multi-faceted perspective to his numerous roles with IU. He served as a member of the Bold Aspirations Campaign Committee, the Eskenazi Building Advisory Board, the Friends of Music at IU Jacobs School of Music, and the IU East Advisory Board. He was inducted into the Wayne County Hall of Fame in 1994 and received the Earlham College Distinguished Alumni Award in 1996. He received the Jefferson Award for Outstanding Community Volunteer from the Indianapolis Star. Additionally, he was recognized for his service to humanity by attaining The Sagamore of the Wabash in 1998 and 2002. He also was honored by being awarded the 1998 IU East Chancellor’s Medallion. As stewards to IU, the Vincents were passionate about giving back to the arts and nursing programs on IU campuses by providing support to the Herron School of Art and Design, the Jacobs School of Music, the IU and IU East School of Nursing, and the Whitewater Valley Annual Art Competition at IU East.